JBPM 4.3: Is it possible to leave current state on timer listener? What I would like to do is checking status from database repeatedly every X minutes. When it found certain status e.g. COMPLETED it should go to the next state, otherwise it will repeat until that status is reached. Is it possible to do that in JBPM? If it's not possible, is there any workaround for my case? I use JBPM4.3 with spring 2.5. 1. Re: JBPM 4.3: Is it possible to leave current state on timer listener? You should use ((ActivityExecution) execution).takeDefaultTransition(); The parent of the current execution is in the inactive-scope state. 2. Re: JBPM 4.3: Is it possible to leave current state on timer listener? Huisheng, thank you for your suggestion. I tried that but it still does not take to next state. 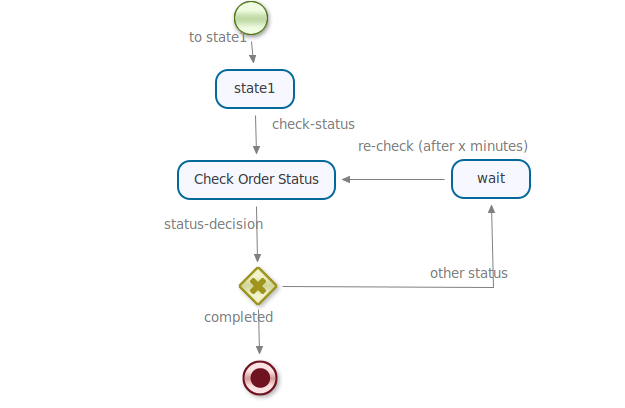 if I remove repeat attribute, no exception is thrown, but it's still in the current state (Check Order Status). 3. Re: JBPM 4.3: Is it possible to leave current state on timer listener? in my opinion event listeners should not be used to change the flow of the process. It should be treated as additional hooks in the process that are not visible on the process diagram and that's why are perfect for non business related activities such as logging, event submition, etc. If you put this in your wait node after 10 minutes (unless it will be signaled) transition will be taken. In your case you could either check all you need in associated event listener when taking this transition or have a user activity (java, custom) for such a check. 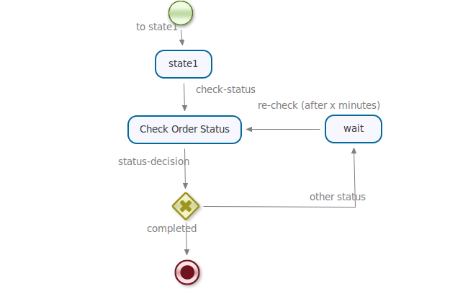 Next you move on to decision point to verify what to do, if status is not yet correct go back to wait state to wait another 10 minute or move on with your process. 4. Re: JBPM 4.3: Is it possible to leave current state on timer listener? STATE_=?, SUSPHISTSTATE_=?, PRIORITY_=?, HISACTINST_=?, PARENT_=?, INSTANCE_=?, SUPEREXEC_=?, SUBPROCINST_=? Do you have any idea why I get this exception? 5. Re: JBPM 4.3: Is it possible to leave current state on timer listener? yeap, I had that as well, there is already open issue for that. Problem is with creating timer in a wait node after going though the loop. The id is the same as for the expired one and both are inside the same transaction. And that error should go away. 6. Re: JBPM 4.3: Is it possible to leave current state on timer listener? Thank you Maciej. It works. 7. Re: JBPM 4.3: Is it possible to leave current state on timer listener? but I get null. What can be the problem? Thanks.